In Hawaiʻi, Kauikeaouli, Kamehameha III, was King and the Great Māhele (1848) was taking place; it was the most important event in the reformation of the land system in Hawaiʻi that separated land title to the King, the Chiefs and the Konohiki (land agents,) and eventually the people. The majority of houses were made of grass (hale pili,) there were about 875 of them; there were also 345 adobe houses, 49 stone houses, 49 wooden houses and 29 combination (adobe below, wood above.) In 1847, Washington Place was built by future-Queen Liliʻuokalani’s father-in-law. Kawaiahaʻo Church (Stone Church) generally marked the eastern edge of town; it was constructed between 1836 and 1842. The “Kauikeaouli clock,” donated by King Kamehameha III in 1850, still tolls the time to this day. Honolulu Harbor was bustling at that time. Over the prior twenty years, the Pacific whaling fleet nearly quadrupled in size and in the record year of 1846; 736-whaling ships arrived in Hawai‘i. Shortly after, however, in 1859, an oil well was discovered and developed in Titusville, Pennsylvania; within a few years this new type of oil replaced whale oil for lamps and many other uses – spelling the end of the Hawaiʻi whaling industry. At the time, Honolulu Harbor was not as it is today and many of the visiting ships would anchor two to three miles off-shore – cargo and people were ferried to the land. What is now known as Queen Street was actually the water’s edge. From 1856 to 1860, the work of filling in the reef to create an area known as the “Esplanade” (where Aloha Tower is now situated) and building up a water-front and dredging the harbor was underway. Fort Kekuanohu (Fort Honolulu) was demolished in 1857; its walls became the 2,000-foot retaining wall used to extend the land out onto the shallow reef in the harbor – some of the coral blocks are still visible at Pier 12. The old prison was built in 1856-57, to take the place of the old fort (that also previously served as a prison.) The custom-house was completed in 1860. The water-works were much enlarged, and a system of pipes was laid down in 1861. The city was regularly laid out with major streets typically crossing at right angles – they were dirt (Fort Street had to wait until 1881 for pavement, the first to be paved.) Sidewalks were constructed, usually of wood (as early as 1838;) by 1857, the first sidewalk made of brick was laid down on Merchant Street. To get around people walked, or rode horses or used personal carts/buggies. It wasn’t until 1868, that horse-drawn carts became the first public transit service in the Hawaiian Islands. At that time, folks were 50-years away from getting automobiles (the first gasoline-powered arrived in 1900;) that same year (1900,) an electric trolley (tram line) was put into operation in Honolulu, and by 1902, a tram line was built to connect Waikīkī and downtown Honolulu. The electric trolley replaced the horse/mule-driven tram cars. Honolulu was to be a planned town. Kinaʻu (Kuhina Nui Kaʻahumanu II) published the following proclamation (1838:) “I shall widen the streets in our city and break up some new places to make five streets on the length of the land, and six streets on the breadth of the land… Because of the lack of streets some people were almost killed by horseback riders ….” By 1850, there was much improvement. By the 1840s, the use of introduced horses, mules and bullocks for transportation was increasing, and many of the old traditional trails – the ala loa and mauka-makai trails within ahupua‘a – were modified by removing the smooth stepping stones that caused the animals to slip. There were five food markets in Honolulu (in thatched sheds) one of which was more particularly a vegetable market. Irish potatoes were $2-$3 per bushel (about 50-lbs;) eggs were $0.25 to $0.75 per dozen; oranges $0.25 per dozen and turkeys and ducks were about $.05 each, chickens started at about $0.25 a piece. Butter was mostly made on the Big Island and Kauaʻi – about 19,000-lbs produced – and sold at an average price of $0.30 per pound; milk was 12 1/2 cents a quart. Fresh beef sold for $0.06 per pound. The fledgling sugar industry was starting to spread across the islands (with the first successful commercial sugar plantation founded in 1835 at Kōloa, Kauaʻi.) It wasn’t until 1852 that the Chinese became the first contract laborers to arrive in the islands. Of the nearly 385,000 foreign contract workers that eventually came, many thousands stayed to become a part of Hawai‘i’s unique ethnic mix. Founded in 1839, Oʻahu’s first school was called the Chief’s Children’s School. The school was created by King Kamehameha III to groom the next generation of the highest ranking chief’s children of the realm and secure their positions for Hawaii’s Kingdom. Missionaries Amos and Juliette Cooke were selected by King Kamehameha III to teach the 16 royal children and run the school. Here, Hawai‘i sovereigns (who reigned after Kamehameha III over the Hawaiian people after his death in 1854) were given Western education, including, Alexander Liholiho (King Kamehameha IV,) Queen Emma, Lot Kapuaiwa (King Kamehameha V,) King William Lunalilo, King David Kalākaua and Queen Lydia Lili‘uokalani. Lots of information here from ‘The Polynesian’ (January 1, 1847,) Greer and Gilman. 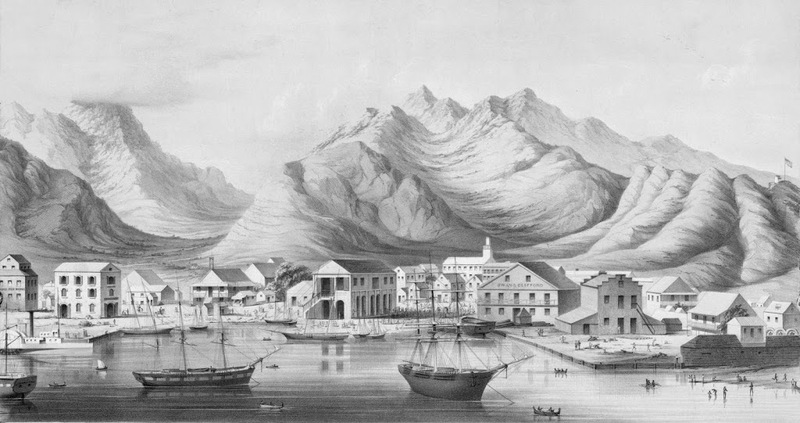 The image shows Honolulu from the Harbor in 1854. In addition, I have added some other related images in a folder of like name in the Photos section on my Facebook and Google+ pages.